In Brighton formerly of San Donato, Italy February 12, 2019. Beloved wife of the late Lucio Quintiliani. Devoted mother of Lucy Huh and her husband Dean of Westerly, RI, Lidia Quintiliani, Josephine Donovan both of Brighton and the late Marina McDonagh. 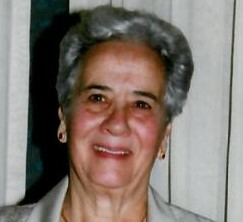 Sister of Donato and Marziano Pesce and the late Alfredo, Gerardo, Vienna and Mario. Grandmother of Danny, Timothy, Daniel, Andrew, Joseph, Matthew, Stephen, Maria and James. Great grandmother of Luca, Jackson and Siena. Mother-in-law of James McDonagh of Dedham. Funeral from the Lehman Reen & McNamara Funeral Home 63 Chestnut Hill Ave. (nr Brighton Courthouse) BRIGHTON Saturday Feb. 16th at 10:30am. Followed by a Funeral Mass in St. Columbkille Church 321 Market Street Brighton at 11:30am. Relatives and friends are kindly invited to attend. Visiting Hours Friday Feb. 15th from 4-8 pm. Interment Newton Cemetery. In lieu of flowers donations in memory of Mrs. Quintiliani may be made to Marina McDonagh Kids College Fund c/o James P. McDonagh 187 Needham St Dedham MA 02026.